On my last visit to Rome, I visited the newly opened contemporary art museum, the MAXXI. 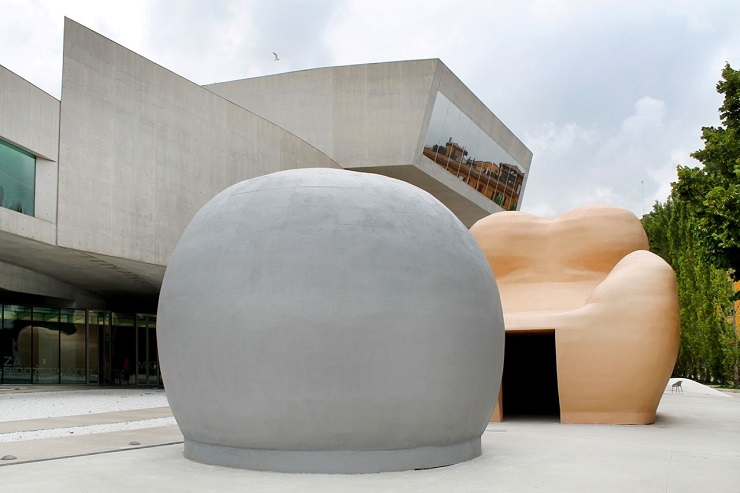 It is a beautiful building architecturally, and though many criticize the small number of exhibitions, for me it was enough just to get familiar with the work of Gaetano Pesce, architect, designer and artist of international repute. Except for the Time of Diversity, the beautiful and colorful indoor exhibition which emphasizes the artist's notions regarding constant change and transformation, what especially caught my attention was the giant version of Up 5&6, Pesce’s iconic armchair which dominates the piazza at the entrance to the museum. This armchair and ottoman, also known as Donna e anche Mamma, depicting a female body chained to a ball, was created by the artist in 1969 in protest at the status of women around the world. Like me, you too may be unwittingly familiar with a few modern versions of this armchair. This huge model site-specific installation of the piece includes a walk-in space. 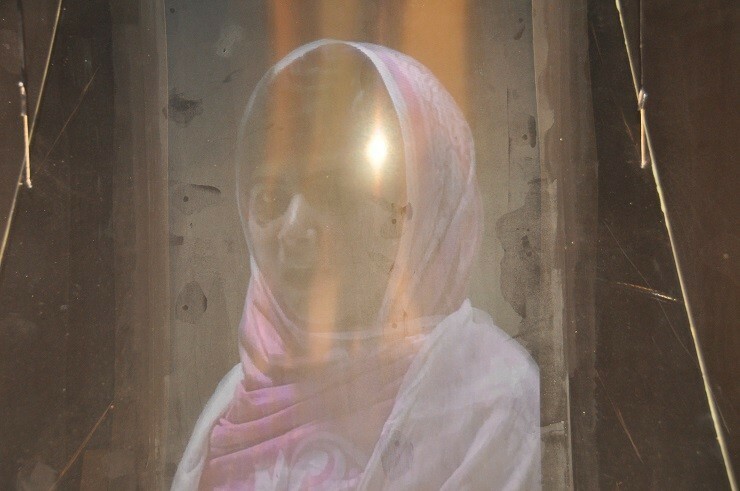 On one side, the ottoman houses, as a special tribute, a hologram of Pakistani rights activist Malala Yousafzai speaking at the age of 16 in the UN to denounce the status of women in her country. On the other side, the chair contains a series of about 40 small screens, broadcasting such politically charged messages as: "Do you know in which country women cannot drive?” The huge installation leaves the visitors with no choice but to go inside and check what else the curator has to say. And that is exactly what I loved about this visit to the museum. It prompted contemplation and gave me an opportunity to discuss the issue of women rights with my daughters, explaining the contemporary relevancy of this problem. And though a lot has changed since Pesce first created this armchair in 1969, we still have a long way to go. It is not only the struggle for women’s right to education, which is still debatable in certain parts of the world, but for their right to a life of fulfillment as a result of their education, alongside the right to a life which aligns with their other intrinsic needs for love and companionship, motherhood and femininity. Education may be a prerequisite, but in some cases it only exacerbates frustration. It is like almost reaching the Promised Land but never being able to actually enjoy its fruits. "Ignorance is bliss,” goes the saying, and I couldn’t agree more. I think of my grandmother who never went to school, couldn’t read or write and lived a long, healthy life as a housewife. I guess I could say she was happy, but even then she knew that we, the following generation of women, deserved more. I keep persuading myself that it is a matter of evolution and that by hard work, playing our role in the current men-denominated environment, we can accomplish our goal of a life of fulfillment, but I now understand that it requires more. It requires an awareness that there is a problem. Our natural instinct to preserve humanity, our need to build and protect a family, our predisposition to nurturing our offspring, our emotional inclinations—they all change our priorities and slowly diminish our killer instinct to succeed, leaving us with a black hole of emptiness and a sense of forfeiture. Just a little awareness, optimism, faith, courage and determination and we'll get there. Not by neglecting our nature, and definitely not by fighting men or burning our bras (we still need them) but by self-assurance, recognizing our strength and using it to our advantage.